A few years ago, I decided to give my sophomore English students a unique final exam that would be student-centered and allow them to get some practice communicating and presenting in English. I assigned them to do a group presentation on a how-to topic in front of the class. How-to tutorials are ubiquitous on the Internet. Websites such as VideoJug, SoYouWanna, eHow, WikiHow, How Stuff Works and Instructables contain a multitude of easy-to-follow lessons on how to do an endless variety of things, from the whimsical (How to Act Drunk) to the serious (How to Comfort a Grieving Person). While some websites offer written instructions, others include a video as well. The benefits of how-to presentations over a standard pen and paper final exam are numerous. Students can develop their presentation skills. They choose their own topics, so are more likely to be interested and motivated. They learn lots of new vocabulary related to their topic. Additionally, they master expressions related to explaining a process and giving a presentation. They can improve their interpersonal skills by interacting with others in a group. And they learn valuable life skills watching the other groups’ how-to presentations. In this article, I’m going to share with you how I present this unique final exam format to my students. Once mid-term exams are over, I give several brief how-to presentations at the beginning of each lesson. One week I show them how to do a magic trick. The next week I demonstrate how to fold a t-shirt in a few seconds. Another week I provide them with a list of titles for 7 how-to videos, and let them choose one to watch a few times in class. Overall, I aim for a diverse mix of topics. After a few weeks, I announce the assignment and put students into groups of 4. I allow the groups to choose any topic they want, as long as it is not too racy. I allow them to gather the information for their topic from any source, including the Internet, books, magazines, friends, or family. I provide them with a handout that gives an overview of the assignment, including suggestions for finding a topic, useful phrases, and details on grading. I also point out what they can do to make their presentations more interesting, such as making eye contact with audience members, using props, putting energy into their voices, and letting the audience participate in the presentation. I recommend they follow this format: The first student introduces the topic and the other group members. The second and third students demonstrate the steps of the process. The fourth student reviews the steps and goes over some new vocabulary that came up during the presentation. A few problems have come up with this assignment and I have found a number of ways of addressing them. The first problem is the use (or abuse) of PowerPoint. Some students will put a large amount of text on PowerPoint slides, and then proceed to read the content of the slide in a monotone voice. I forbid the use of PowerPoint, and allow students to use only three images which they can hold up. 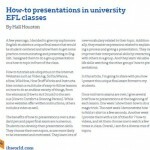 I remind them that the presenters should be the stars of the presentation, not an endless series of PowerPoint slides. The second problem is insufficient preparation. A few groups will come to class during finals week poorly prepared, and give a very sloppy presentation. To prevent this, I demand that my students prepare everything a week ahead of finals week. Each group sits down with me privately and delivers a rough version of their presentation. I give them feedback on which areas are satisfactory and which areas they need to improve on. Then I push them to make a few changes to their presentation, so that they can shine the following week. The third problem is lack of attention. When students are giving their presentations, I am disappointed to see students conversing, checking their smart phones, or doing some last minute preparation for their group presentation. On the day of presentations, before the first presentation begins, I point out that it is polite behavior to give the other students their full attention when they are giving their presentations. I also warn them that their grade will be affected if they are not paying attention. I’ve done this type of final exam for several years and have always been impressed by the students’ ingenuity and enthusiasm. I’ve seen presentations on everything from how to tie a necktie to how to deal with menstrual cramps. I think it boosts their self-confidence and helps them gain fluency in English. Most of all, I feel they prefer doing a final exam where they played a part in shaping the content. 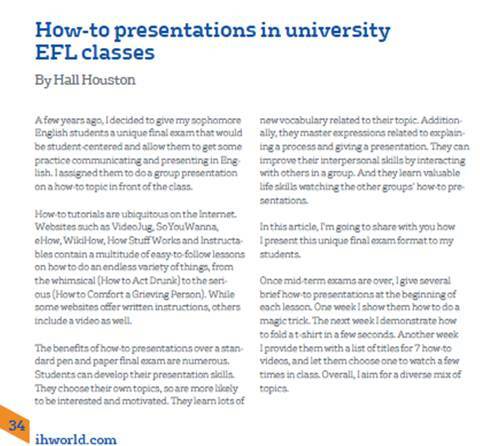 If you would like to use how-to presentations with your class, I would recommend you consult some different how-to websites (see below). You should also familiarize yourself with some basic presentation skills. Consider what problems might come up with this type of activity and strategize how you can address those problems. I highly recommend use of how-to presentations as a superb way to get students practicing English and improving their presentation skills. Hall Houston teaches at Kainan University in Taoyuan County, Taiwan. His articles have been published in periodicals such as It’s for Teachers, Modern English Teacher and English Teaching Professional. 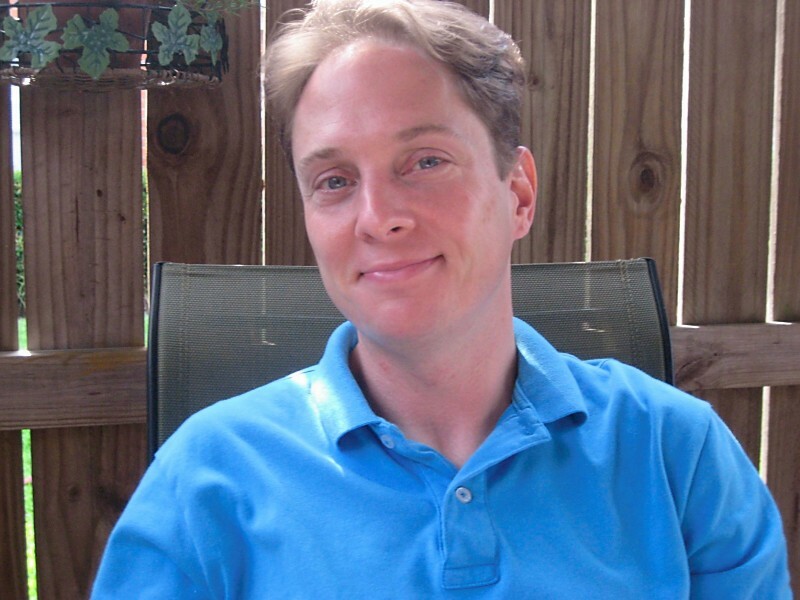 He has written three books about language teaching, The Creative Classroom, Provoking Thought, and The ELT Daily Journal (published April 2013). Back to Issue 34:summer 2013 of the IH Journal of Education and Development.